Tarot Peeper T10X Burshless Gimbal with HD 10x optical zoom camera is widely used in public security monitoring, power inspection, searching and rescuing, remote sensing mapping, life exploration and other types of UAV dron missions.With the gimbal suspension hook comes with the gimbal, it is easy to install on all kinds of multi-rotors. 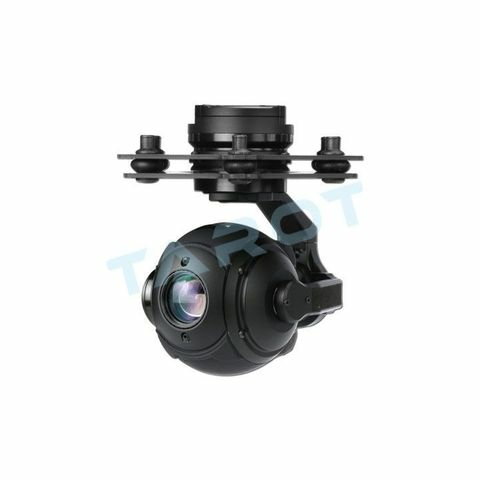 Tarot Peeper T10X gimbal adopts CNC overall spherical integrated structure industrial design to achieve the light weight and strongest stability effect.Built-in 10x optical zoom lens, aperture value: F2.0 uses 1/3" color CMOS4 image sensor, effective pixels reach 4 million effective pixels(2688 x 1520 pixels). The 10x optical zoom delivers breakthroughs in light and space, giving the vision a new dimension to capture clear, precise large-area search areas anytime, anywhere. Make your work more efficient, easy and safe. High-precision drive algorithm, integrated precision servo drive module, independent IMU control pan/tilt attitude, attitude control accuracy reach to +-0.02 degrees. Point angle is 420 degrees, support 3-6S wide voltage input.Micro-SD card slot is overhead to avoid the rain influence.HDMI1.4 HD output port is available. User Manual and Software, please check here.